Caution. 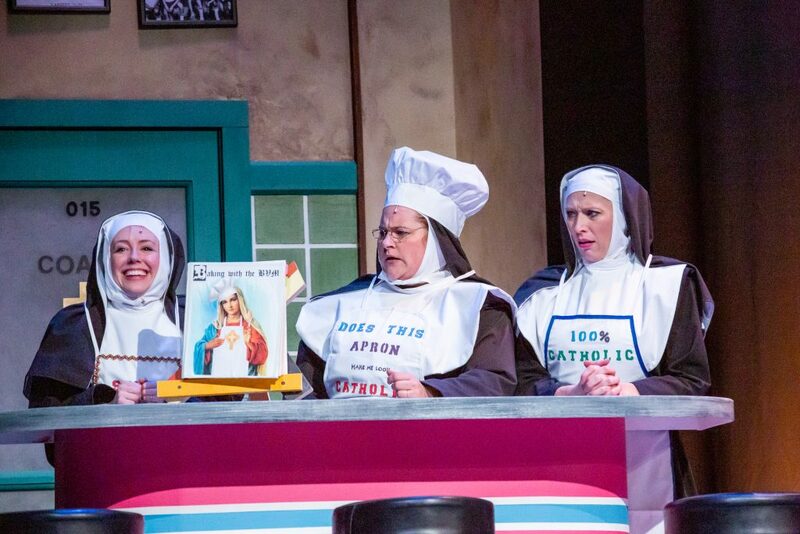 Finding great fun in “Nunsense” just may become habit forming. (Sorry, but I just could not stop myself). Did you ever look at nuns with suspicion and perhaps with caution that they just might be an overly-stern and pious group of somewhat “older” women. Forget all that. Those on stage this season in Johnstown are a merry band, providing pure entertainment. It would be interesting to meet the show’s creator, Don Coggin in person. He is the chap that put the show together. The book, music and lyrics are all due to his unique ideas. He has excellent help with this production, under the skilled direction of Pat Payne, with choreography by Stephen Bertles. They must be clever drill sergeants, as the entire cast is a whirlwind of energy, precision, and talent. 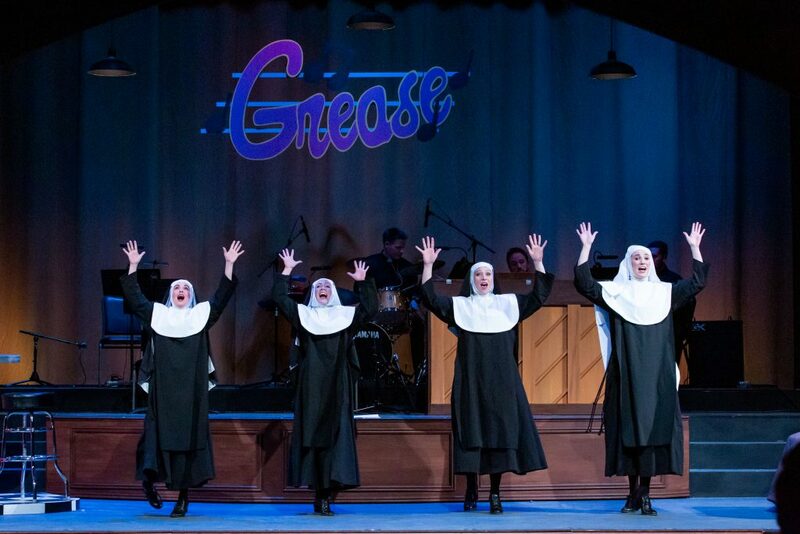 The musical, as performed, is supposedly a benefit performance to raise money to bury four deceased sisters from the Little Sisters of Hoboken religious order. I may have the details slightly confused as to how this came about. Something about the nuns running a leper colony on an island south of France. Their cook (Sister Julia, Child of God) accidently killed 52 of the sisters by cooking up an ill-fated vichyssoise. Only five nuns remained healthy after the food poisoning. They now live in Hoboken, NJ, and were able to find financial resources to bury 48 of the deceased. They have kept the remains of the final four in the freezer, and the health officials are becoming suspicious. Now they are trying their darndest to come up with funds to “plant” the remaining four. Thus the benefit. What a benefit they put together. 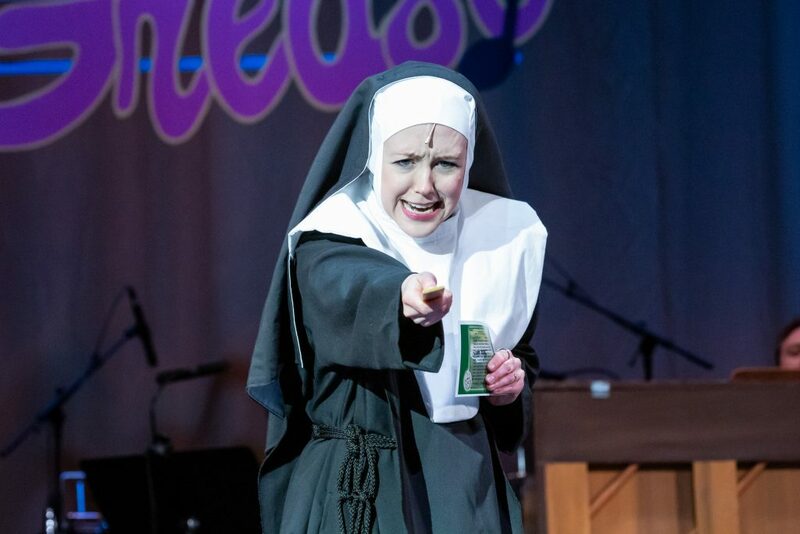 The five nuns are a whoop and a holler, under the stern direction of the over-the-top Mother Superior, superiorly portrayed by Samantha Jo Staggs. This woman has no bones in her body. At the conclusion of Act I she has a tour-de-force rendition of a naïve sister becoming high while sniffing a little bottle of “Rush.” She is a former circus performer who can’t resist the spotlight. In reality, the spotlight just can’t resist her. Each of the five sisters is given a moment to shine. Lisa Kay Carter is sensational as Sister Amnesia, with no idea who is she or where she is. She lost her memory when a crucifix fell on her head. Before she became a nun, her name was “Sister Mary Paul,” destined to be a country western star. Now she wanders around the convent with wide-eyed oblivion, and provides great delight with her foul-mouthed puppet. 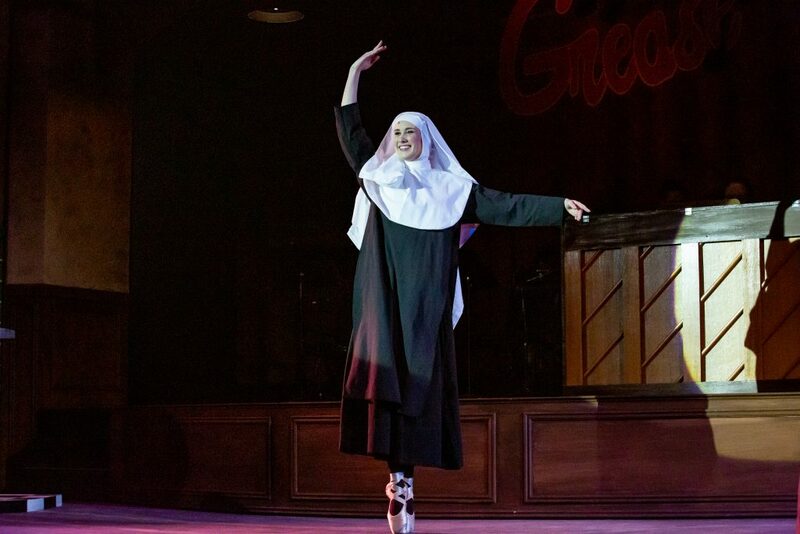 Abigail Hanawalt dazzles as Sister Mary Leo, a novice whose desire is to be the world’s first ballerina nun. Heather McClain becomes Sister Hubert, the dignified, but competitive second-in-command – always causing the Mother Superior to watch her back. Sister Hubert is waiting. These are five enormously talented women who completely lose themselves in the lunacy of the moment. They can sing. They can dance. They can whoop. They can holler. They can completely enthrall the enthusiastic audience. 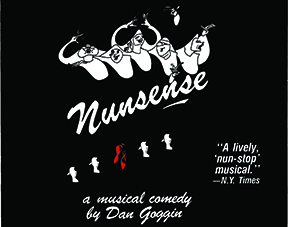 “Nunsense” turned up off Broadway in 1985 and ran for 3,672 performances, becoming the second-longest running Off-Broadway show in history, second only to “”The Fantasticks.” It became an international sensation and reportedly 25,000 women have played in the show’s productions worldwide. Patrons at Candlelight are in the “habit” of enjoying excellent shows. “Nunsense” keeps this tradition alive and well with five zany Little Sisters of Hoboken.